That’s the first question ten thousand incoming freshmen will be met with as they move into their dorms on the campus of UCLA later this summer. In response to the skyrocketing number of cases involving depression in young people, UCLA has launched the Depression Grand Challenge, an initiative that will help researchers study causes and treatments of this debilitating disease. UCLA is breaking new ground with this enormous study. Other colleges need to follow suit. Experts with the Partnership for Drug-Free Kids say, “We need to consider students’ emotional preparedness when we help prepare students for their transition from high school to college.” The ability to take care of oneself, adapt to new environments, control negative emotions or behavior and build positive relationships — that’s emotional preparedness. It’s believed these attributes are linked to success during the first year of college. But how do we know if our kids are emotionally prepared to deal with being away from home? Academically they should be ready. After all, their grades, test scores and ability to write a college entrance essay got them to this point. But it’s not so easy to measure what’s going on emotionally. Every parent knows transitions are tough. They can be potential danger points for kids. Think about the change from elementary to middle school, and the movement from middle to high school. There are times when your child has shown great interest in taking that next step and other times when he or she has appeared ambivalent, at best. College includes much more than academics; it’s the stress of making new friends, maintaining one’s health and well-being and financial aspects such as paying for school or handling a part-time job. Many college freshmen report stress, anxiety and overwhelming emotion. Before UCLA had started their Depression Grand Challenge, researchers there found that one in 10 freshmen said they frequently felt depressed. 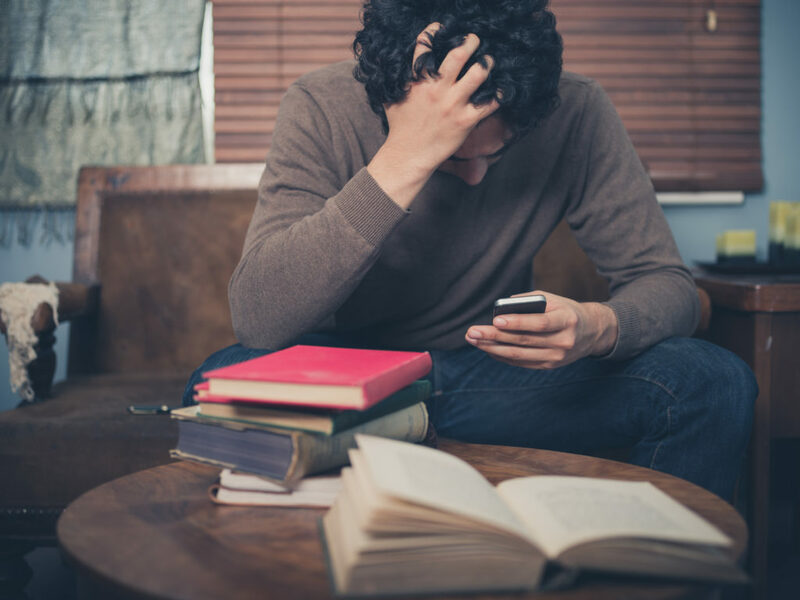 Another report by the American College Health Association revealed that nearly two thirds of college students have said they experienced “overwhelming anxiety” in the past year. Almost one third of students have reported regularly consuming alcohol or using drugs during their first semester of college. It’s crucial to give your child coping skills before he or she turns to unhealthy or risky behaviors for relief. Be more attentive to your child. Know what your child is thinking about attending college, share your thoughts about college, help by sitting down together and devoting time to working through the process, look on the internet, and review brochures that arrive in the mail. Communicate regularly and openly. Begin to have discussions when they start high school, collaborate with school counselors, attend meetings with your child so you’re both on the same page regarding college. Problem solve together. Discuss different scenarios like what would you do if you are away at school and feeling homesick/, stressed, depressed, having trouble concentrating, dealing with a roommate, etc. Help instill confidence. Assist your child (throughout their lives) in recognizing and developing his or her special talents and gifts. Work together exploring ways to use these gifts to your child’s benefit — participating in a sport, debate group, artistic or musical endeavor. Help build life skills. Learning how to prepare simple meals, do one’s own laundry, set up appointments, manage money and a bank account are all important skills. Make sure to teach your child to be his or her own best advocate. Aid your child in the selection process. Help your child pick a school that best meets his or her needs academically and socially by asking pertinent questions. Are they interested in a small, medium or large school that offers a particular major, has a Hillel house or certain percentage of Jewish students, in a city, rural area or the suburbs? Provide practical information regarding substance use and mental health issues. Does your child know the legal drinking age is 21, marijuana use is illegal, suicidal thoughts should raise a huge red flag, sleeping too much or too little can be dangerous to one’s health and safety? Show a level of open mindedness and knowledge of the realities of college life. Let your children know that you have been there, share some of the positives and growth producing experiences. Parents need to utilize all of the supports available to help their child with emotional well-being. Counselors and other professionals should be considered when matters like alcohol, drug abuse and mental health issues become apparent. Remember that the work continues even after your child moves into the dorm. Communicate on a regular basis, be it by email, text or telephone. Keeping the lines of communication open with your child is the best going away gift you can give them. Ilene Federman is manager for Adult Therapy Services at JCS.